Light propagating through a metamaterial follows a curved trajectory that drags light with different circular polarization in opposite transverse directions to produce a giant photonic Spin Hall effect. Using metamaterial surfaces, researchers were able to amplify the signal of the photonic Spin Hall Effect, making it directly observable with simple detection techniques, and control the propagation of light and circular polarization. Researchers with the U.S. Department of Energy (DOE)’s Lawrence Berkeley National Laboratory (Berkeley Lab) have once again demonstrated the incredible capabilities of metamaterials – artificial nanoconstructs whose optical properties arise from their physical structure rather than their chemical composition. Engineering a unique two-dimensional sheet of gold nanoantennas, the researchers were able to obtain the strongest signal yet of the photonic spin Hall effect, an optical phenomenon of quantum mechanics that could play a prominent role in the future of computing. Zhang is the corresponding author of a paper describing this work in the journal Science. The paper is titled “Photonic Spin Hall Effect at Metasurfaces.” Co-authors are Xiaobo Yin, Ziliang Ye, Jun Sun Rho and Yuan Wang. The spin Hall effect, named in honor of physicist Edwin Hall, describes the curved path that spinning electrons follow as they move through a semiconductor. The curved movement arises from the interaction between the physical motion of the electron and its spin – a quantized angular momentum that gives rise to magnetic moment. Think of a baseball pitcher putting spin on a ball to make it curve to the left or right. Metamaterials have garnered a lot of attention in recent years because their unique structure affords electromagnetic properties unattainable in nature. For example, a metamaterial can have a negative index of refraction, the ability to bend light backwards, unlike all materials found in nature, which bend light forward. Zhang, who holds the Ernest S. Kuh Endowed Chair Professor of Mechanical Engineering at the University of California (UC) Berkeley, where he also directs the National Science Foundation’s Nano-scale Science and Engineering Center, has been at the forefront of metamaterials research. For this study, he and his group fashioned metamaterial surfaces about 30 nanometers thick (a human hair by comparison is between 50,000 and 100,000 nanometers thick). 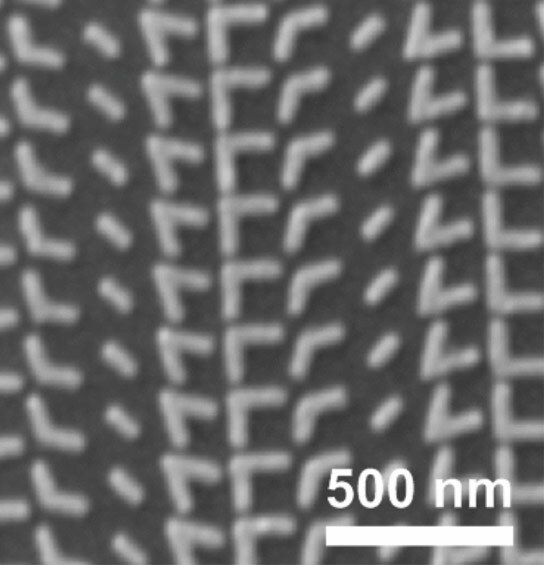 These metasurfaces were constructed from V-shaped gold nanoantennas whose geometry could be configured by adjusting the length and orientation of the arms of the Vs.
Scanning electron microscopy image of a metasurface comprised of V-shaped antennas with a variety of arm configurations. 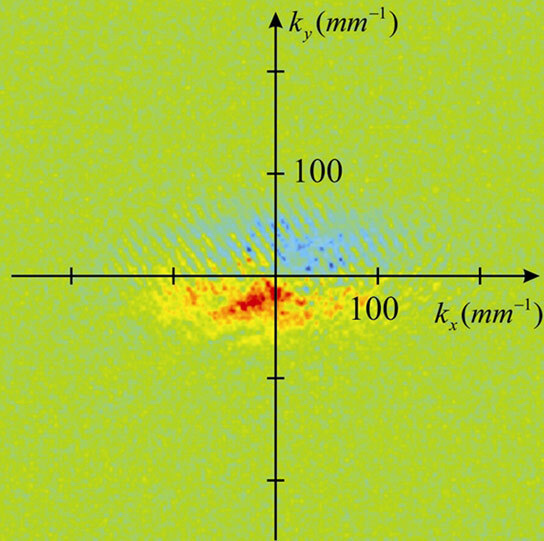 Since the entire metasurface sample measured only 0.3 millimeters, a 50-millimeter lens was used to project the transmission of the light through the metamaterial onto a charge-coupled device (CCD) camera for imaging. From the CCD images, the researchers determined that both the control of light propagation and the giant photonic spin Hall effect were the direct results of the designed meta-material. This finding opens up a wealth of possibilities for new technologies. Yin says the ability to control left and right circular polarization of light in metamaterial surfaces should allow for the formation of optical elements, like highly coveted “flat lenses,” or the management of light polarization without using wave plates. Be the first to comment on "Metamaterials Amplify the Photonic Spin Hall Effect"